Cureatr expands industry leading secure messaging and communication platform to include medication histories for over 265 million patients across the United States. NEW YORK, NY – January 31, 2019 – Cureatr, the country’s leading, mobile real-time healthcare information provider, today launched a one-of-a-kind, medication management app, Meds 360◦, as part of the company’s continuing mission to close information gaps in patient care with useful, mobile, and immediate insight and information. Meds 360◦ provides clinicians a comprehensive view of a patient’s medication history through real-time visualization of all major PBM and retail pharmacy data for that patient, including cash payments at the pharmacy. 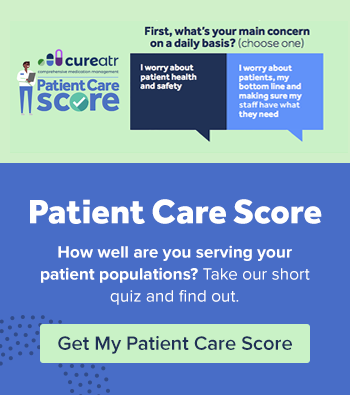 Importantly, this data is not generally part of the EMR record and represents a significant gap in a care provider’s complete picture of the patient. Meds 360° organizes this data the way providers want, highlighting therapeutic duplications, gaps in pills-on-hand, strength changes, prescribers, fill dates, and opioids on a single, easy-to-use interface that helps clinicians reduce medication errors, predict issues before they become risks, and ensure medication adherence after the care encounter. 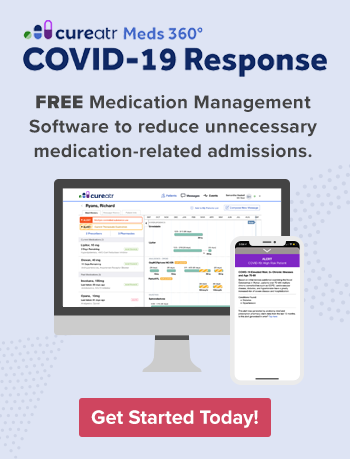 The application sits on top of Cureatr’s secure communication and messaging platform, which alerts and notifies providers about drug-to-drug interactions and problematic opioid prescribing, such as multi-provider and excess morphine milligram equivalents (MMEs). Providers can securely send the data and any relevant messages to the patient, pharmacist, family member, or other care provider, from a mobile device or from their computer. While clinicians generally cite medication nonadherence as the primary reason for failed clinical goals, mounting evidence indicates that nonadherence is only a piece of a much larger issue – inadequate medication therapy. Meds 360◦ changes the game by giving caregivers easily accessible, real-time prescription fill data, past and present, in an easy to read longitudinal view, organized by drug categories to help combat issues with suboptimal medication therapy such as non-adherence, adverse reactions, unnecessary therapies, inappropriate dosage, and inadequate therapy. It is well known that the United States is in the midst of an opioid epidemic. In 2016, 66.4% of the 63,600 overdose deaths (42,249) in the U.S. involved opioids. Meds 360° provides the point-of-care tool to rapidly identify nefarious prescribing/dispensing activities across health systems and state lines. To learn more, join our free webinar, Optimizing Medication Management with Meds 360◦, on February 20 at 3:00 PM ET. Click here to register. Meds 360◦ will also be on display at HIMSS19 in Orlando this month. If you’d like to meet with Cureatr, you can schedule a meeting by clicking here. For a personalized consultation and demonstration, click here. Cureatr is the country’s leading mobile, healthcare information provider, connecting patient data that exists outside of the electronic medical record to create a picture of a whole patient, giving clinicians vital depth and context into who they are, what illnesses they’ve faced, what medications they’ve taken, where they’ve been within healthcare facilities and where they’re going, as they’re going there, in real-time, so clinicians can take real action to deliver better care. For additional information, please visit Cureatr's site.